Discussion in 'Windows Guides' started by InsaneNutter, Sep 18, 2008. If you have a new graphics card such as the Radion HD 3450 your graphics card most likely has an audio controller onboard, this means you can output video and sound when your computer is connected to a TV with a HDMI port. If you are using a DVI to HDMI adaptor you will need to use one that supports audio from the graphics card’s DVI connection as well as video. If your graphics card doesn’t come with a DVI to HDMI adaptor that supports audio have a look on Ebay and search for “ATI DVI to HDMI” all the official ATI adaptors should be fine for this. I can’t really provide a list of graphics cards that have an audio controller onboard but it should be listed on the graphics cards manufactures website if your particular card supports this or not. If you know you’re hooked up with the correct cables and adaptors lets begin! On the right click menu select Set as Default Device. That’s it, simple as that! The audio controller on your graphics card will be the default sound device. You might have to select the volume control in to the system tray and ensure the volume is fully turned up. Your sound will now be going through the HDMI cable to your TV or Receiver as well as the picture. 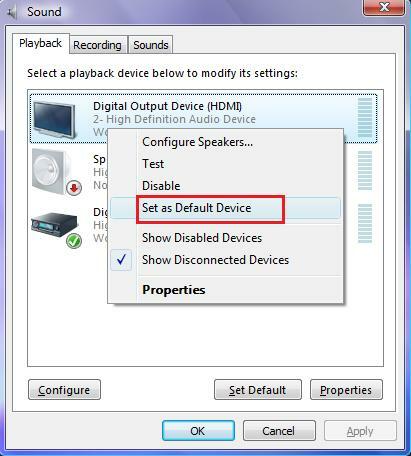 If you ever want your sound to play though your computers sound card just set it as the default device again. 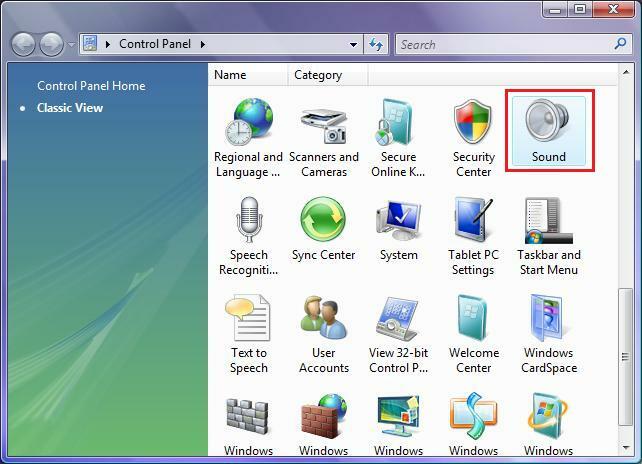 For Windows XP it’s the exact same process the menu’s are just set out slightly different. Unfortunately I don’t have a computer running Windows XP to provide screenshots of the process. Click the start button, go to control panel and click switch to classic view in the top left if needed, then click on Sound and Audio Devices. 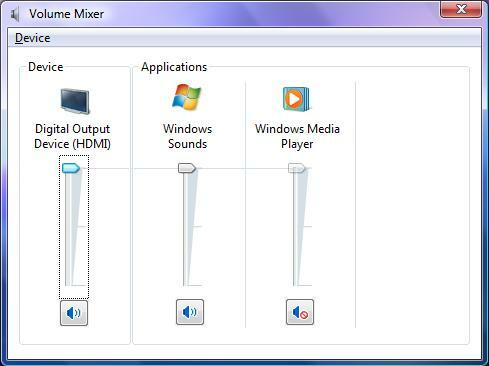 You will then be presented with the Sound and Audio options for your computer, click on the Audio tab and select ATI HD Audio as the default device and click ok. There you go, your sound will now be going through the HDMI cable to your TV or Receiver as well as the picture. Exatcly what i have been doing for years now. Even people did not belive me.thank you for taking your time to attach pics m8. So now i know i am right. 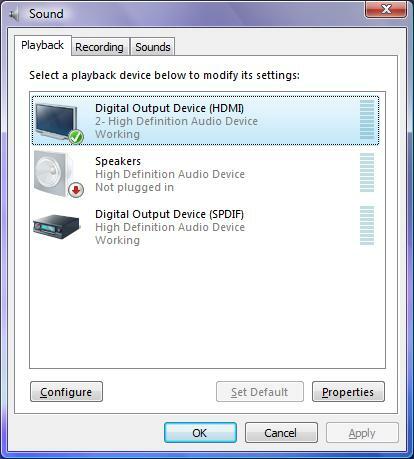 I tried the listed directions and was unable to find any other device than my sound card listed in the default sound options. I have a Dell Precision M6300 with Nvidia Quadro FX1600M video card. I bought a DVI to HDMI cable which stated it does not transmit audio. I thought that meant all DVI transmitted only video. So in addition to that cable, I also bought a Y audio cable thinking I could connect the one end to the headphone jack of my laptop and the other to the stereo audio jacks that go with the HDMI. The video works on my TV flawlessly. But no sound. If I unplug the audio cord from my headphone port, I hear audio from my laptop. Now I'm thinking that the TV doesn't let me attach both audio and HDMI. This makes me think that if my laptop video card allowed DVI w/audio, then it should be listed in the Sound settings as an option other than my Sigmatel audio card. Also, even if the reviewer of the DVI cable I bought was correct in saying that I need a separate Y cable for audio, perhaps it's my TV that won't let me do a separate audio cable for DVI video input. If you can advise a solution using the components I already purchased, that would be ideal. I am open to the idea of purchasing a DVI w/audio cable but as I mentioned, I didn't see any other audio option listed in settings other than my Sigmatel audio card. For anyone that thinks they are technically smart enough to make AUDIO functional over HDMI on WinXP please look at this PDF and see if you can help me.